At the Council of Ontario Directors of Education (CODE) it is our goal to offer resources that will help families as they guide their children in learning skills that are essential for success at school and throughout life. CODE has produced a series of resources with input from parents across Ontario. We invite you to scroll down the page and read a short description of these resources then follow a link to learn more and access the resources for any or all of the topics that have been covered to date. Parents, students and educators from Ontario's English and French language school boards have helped create this Tool Kit by participating in consultations, and in providing written content. This website offers advice for parents, teachers and students about using the Internet. You will find an e-parenting interactive tutorial to help you keep up with your teen's online activities along with advice about video games, music and television programs. Royal Canadian Mounted Police offer a website with information about staying safe when using the Internet, cellular phones or webcams; online scams and fraud; cyberbullying and Internet security. Suggest to your teen that they start to collect samples of their schoolwork in an electronic folder and create an e-portfolio. Work with your teen to help them revise and update the portfolio on a regular basis. Samples can be removed or added as your teen's work evolves. Essays, poetry, projects, artwork are just a few examples to include. This portfolio would be useful for future school and job applications. Students can use free website applications like Blogger, Wikispaces and Google sites to post their work. They can also use the website that is available to school boards as part of the e-learning strategy. Check with your school's student services or guidance department about e-learning courses that are offered in your secondary school. These courses are teacher facilitated and use many technological tools such as blogs and chats to ensure that there is interactive discussion between teacher and students as well as students and students. Students and parents also have access to a website called Ontario Educational Resources Bank (OERB) which is part of the Provincial e-Learning Strategy. 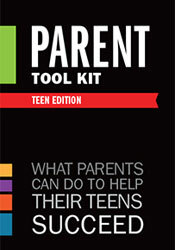 You and your teen can get access to the OERB resources at home. Suggest your teen ask a teacher or principal for the student login information. You will find games and activities that will help reinforce some of the concepts used in the classroom. You can search for information on subjects/credits by grade and course. Help them get homework support. Your teens want you to show interest in what they are doing, so show them ways to get help when they need it. Online math tutoring is available through TVO's Independent Learning Centre's Homework Help website at https://homeworkhelp.ilc.org/ Grade 7 to 10 math students receive individualized and confidential online help from certified Ontario teachers from Sunday to Thursday during the hours of 5:30 pm to 9:30 pm. Videos of tutorials and frequently asked questions are available at any time at http://www.edu.gov.on.ca/ elearning/homework.html. Consult your teen's teachers or Student Services about other types of support during and after school hours. Information about the Student Success program is available at www.edu.gov.on.ca/ morestudentsuccess/teams.html. CODE invites parents to send your questions and comments to us. Click here to submit your questions or ideas. Thank you for your commitment to parent engagement in your school community!